Greetings, everyone! The Iron Guy is pleased to present you a collection of cool stuff I've read lately plus one audiobook. These are in random order. No theme to this selection--just stuff that I pulled off the shelves that looked interesting. Most of these would be good for younger reader guys, like second and third graders, but older guys would also get a smile or two out them. Wow! Are these books fun! I read three--Ricky Ricotta's Mighty Robot, Ricky's Ricotta's Mighty Robot vs the Jurassic Jackrabbits from Jupiter and Ricky Ricotta's Mighty Robot vs the Unpleasant Penguins from Pluto. In the first, we meet Ricky Ricotta, who is "A little mouse with a big problem." The bullies at school make his life miserable plus he has a hard time making friends. Where could he find a buddy who could also keep the bullies away? Meanwhile, Dr. Stinky McNasty has created a giant robot to destroy Ricky's town of Squeakyville. Who could stand between it and the town's destruction? Could it be Ricky? In the second, the evil General Jackrabbit has created three enormous killer rabbits with dinosaur heads to take over the Solar System. Could even a Mighty Robot withstand a Rabbidactyl, a Trihareatops and a Bunnysaurus Rex? As I said, these books are a lot of fun! And the artwork is nothing short of awesome! Besides, how could you not enjoy books that have Flip-O-Rama?? Gordon Blue and his younger brother Benny seem like ordinary school kids living in Fowladelphia but the have a secret--they are really superheroes!! In the first, Let's Get Cracking, Gordon and Benny are at the annual Fowl Fall Festival. Things seem ordinary when, suddenly, all their classmates lose all their feathers! And, just as suddenly, there's an old granny selling knitted sweaters! Time for Kung Pow Chicken and Egg Drop to spring into action! But are Kung Pow's Drumsticks of Doom any match for the Naughty Knitting Needles? Every hero has a sidekick, of course, and Kung Pow Chicken has his younger brother, aka Egg Drop. So, when in Heroes on the Side, Egg Drop gets invited to a sidekicks party in New Yolk City, things seem fine--until are the sidekicks are trapped by Ticklebeak and his Bad Eggs!! (Fortunately, Gordon and Benny were in their hotel room) The heroes rush in to save the sidekicks but the Bad Eggs get away. But wait--there's a plot to capture to heroes as well! Can sidekicks save the day? These are also a lot of fun with goofy jokes and chicken superheroes. I ask you again--how could you not enjoy them? Have you ever heard the expression that "truth is stranger than fiction"? Well, sometimes is it not only stranger, it's a whole lot goofier! 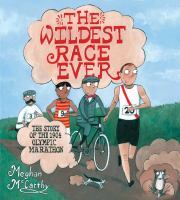 You'll definitely believe that when you read this true story of the first Olympic Marathon held in America. It was held in conjunction with the 1904 World's Fair in St. Louis. And it was summer. 90 degrees on the day of the race! And they ran on dirt roads. With cars that passed by and choked the runners with dust. Some runners were more interested in looking good than running fast. One guy got chased a mile off course by a dog! Another guy, from Cuba, stopped and practiced his English with cheering spectators! The doctor drove off a 30-foot embankment and the winning runner didn't win! Oh, man, that was a wild race and this is one very entertaining book. It's short, funny and a truly good Quick Read. Plus, there's a good section at the end that tells what became of the main runners after the race and about the 1904 World's Fair. This book would be good for younger and older readers. Wow, oh, wow, I have certainly saved the best for the last. 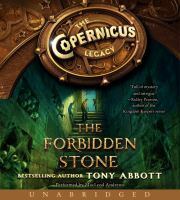 This is the audiobook version of the first book in that amazing Copernicus Legacy series by the incredible Tony Abbott. If you have read this blog for a while, you'll know that I'm a HUGE fan of these books. (It would take too long to tell you about them, so click on the Copernicus Legacy or The Forbidden Stone label under this post to find out more) This recording by actor MacLeod Andrews perfectly captures all the things that are great about The Copernicus Legacy--the danger, the mystery, the almost-unbearable suspense, the coded puzzles, the creepy bad guys and even the humor. I found myself listening while driving around town, while coming to work, when coming home from work--and then sitting in the driveway to hear a little more! You won't want to stop listening either! BTW, this is long and complicated for younger guys but it would be perfect for fifth and sixth graders. OK, here's a good selection of cool reads and listens. Don't tell me there's no time--these are quick and fun. And, if you get driven to school, this audiobook is the perfect way to pass the time. Besides, I bet the grownups will enjoy it too! These are all very different, yet they each sound like they'd be great for boy readers. Great list of books kids and probably this big kid would enjoy. Thanks for the recommends. The "true story" about the first American marathon sounds really intriguing to me, but I know my sons would probably enjoy all of these. I always enjoy your recs for boys. Batter Up! And Readers Up! World Series of Reading 2016!